Magdalena Racing’s Dothraki Queen and Mike Rutherford’s unbeaten Stageplay have stakes wins on their respective records, but Three Chimneys Farm’s dazzling maiden winner Carina Mia is the 2-1 morning line favorite in a field of nine 2-year-old fillies entered to compete in Saturday’s 72nd running of the $200,000 Golden Rod (Grade II), a points race on the 2016 “Road to the Kentucky Oaks” series and the co-featured event on the “Stars of Tomorrow II” program on the next-to-last day of Churchill Downs Racetrack’s Fall Meet. The 1 1/16-mile Golden Rod is scheduled as the ninth event on the 12-race “Stars of Tomorrow II” program devoted exclusively to races for 2-year-olds, and is co-featured Saturday with the 89th running of the $200,000 Kentucky Jockey Club (GII), a scoring race for the 2016 “Road to the Kentucky Derby” series Post time for Saturday’s first race is 12:40 p.m. (all times EST), and the Golden Rod field is set to break from the starting gate at 4:35 p.m.
All fillies in the Golden Rod will carry 119 pounds. The Golden Rod winner will automatically be nominated to the 2016 running of the $1 million Longines Kentucky Oaks (GI) and collect 10 points in the “Road to the Kentucky Oaks” standings. The top four finishers earn points on a 10-4-2-1 scale. Carina Mia, a bay daughter of Malibu Moon, earned the role of Golden Rod favorite in a sizzling 9 ¾-length victory in an Oct. 29 maiden race at Keeneland. She led most of the way and covered 6 ½ furlongs in rapid 1:15.18 over a fast surface. 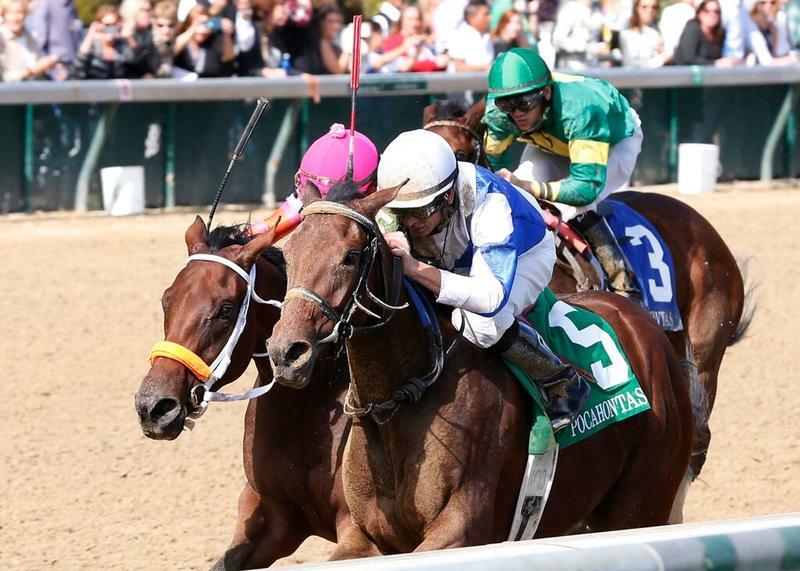 Mott’s filly had been runner-up to Golden Rod rival Stageplay in her Keeneland debut, also at 6 ½ furlongs, on Oct. 10. A victory by Carina Mia in her stakes debut would provide Mott, Churchill Downs’ all-time leader in wins and stakes victories, with his second Golden Rod victory. He saddled Gold Sunrise to win the race in 1995. The daughter of Malibu Moon will be ridden by Julien Leparoux and breaks from post eight in the Golden Rod. Dothraki Queen, winner of Churchill Downs’ $200,000 Pocahontas (GII) on Sept. 12 and third to Fox Hill Farm’s unbeaten Songbird in the $2 million 14 Hands Winery Breeders’ Cup Juvenile Fillies (GI), and unbeaten Stageplay, winner of the $80,000 Rags to Riches Overnight Stakes on Churchill Downs’ “Stars of Tomorrow I” program on Nov. 1, are the Golden Rod’s co-second choices at 5-2. A sure hunch bet for fans of the HBO series “Game of Thrones,” Dothraki Queen is off to an impressive start on her young career and a triumph by the Pocahontas winner would provide her with a second graded stakes victory at Churchill Downs. But the most impressive effort in her five races for trainer Kenny McPeek was her third-place run in the Breeders’ Cup behind Songbird, whose perfect campaign has made her a strong favorite to be declared the Eclipse Award champion of this year’s 2-year-old filly crop. She rallied from last among 10 in the Juvenile Fillies to finish behind Songbird and runner-up Rachel’s Valentina, winner of Saratoga’s Spinaway (GI) and a daughter of 2009 Horse of the Year Rachel Alexandra. The Pure Prize filly won her July 12 debut for McPeek at Kentucky’s Ellis Park before making a successful leap into stakes competition with her September win the 1 1/16-mile Pocahontas, a Breeders’ Cup “Win And You’re In” event that secured Dothraki Queen a spot in the starting gate for the Breeders’ Cup Juvenile Fillies. She also was runner-up to Reddam Racing’s Gomo over a sloppy track in Keeneland’s $400,000 Alcibiades (GI) prior to her Breeders’ Cup run. Dothraki Queen enters the Golden Rod with a record of 2-1-1 in four races and has earned $417,680. McPeek’s filly will start from the outside post under regular rider and Fall Meet win leader Corey Lanerie. The highly-regarded Stageplay is perfect after the first two races in her young career. 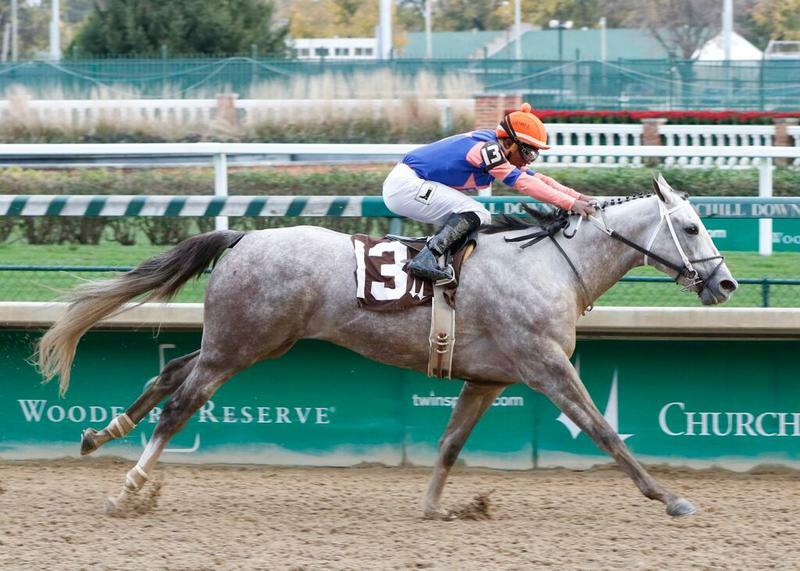 She was an impressive three-length winner in her 6 ½-furlong debut at Keeneland on Oct. 10, and followed that effort with a 1 ½-length triumph as the 3-5 favorite in Churchill Downs’ $80,000 Rags to Riches Overnight Stakes at a mile during the Nov. 1 “Stars of Tomorrow I” racing card. The Steve Asmussen-trained daughter of two-time Horse of the Year Curlin will make her debut in graded stakes competition in the Golden Rod. 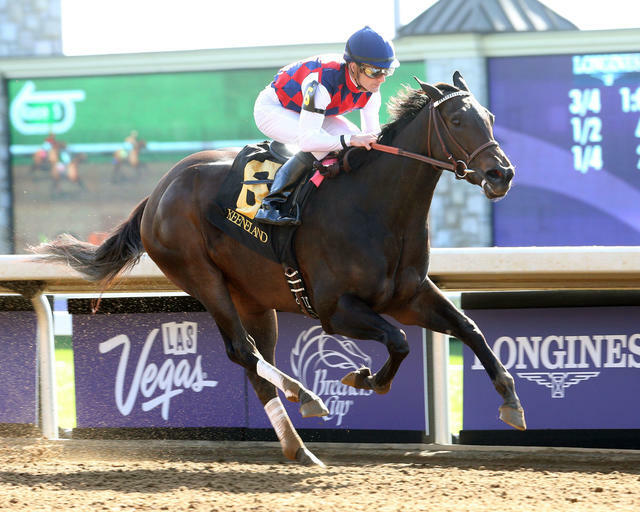 Recent Golden Rod winners include Rachel Alexandra (2008) and Silverbulletday, whose Golden Rod victory concluded a 1998 campaign for which she earned the Eclipse Award for champion 2-year-old filly. Stageplay will break from post three under Ricardo Santana Jr. as Asmussen’s filly attempts to provide her trainer with his first victory in the Fall Meet’s premier race for 2-year-old fillies. Others promising Golden Rod contenders include Stoneway Farm’s Dream Dance, Michael Bruder’s unbeaten Susies Yankee Girl and G. Watts Humphrey Jr. and St. George Farm Racing LLC’s Sugar Cone. Dream Dance, an Afleet Alex filly who was runner-up to Stageplay in the Rags to Riches and second via disqualification in Dothraki Queen’s Pocahontas, will break from post seven for trainer Neil Howard. Susies Yankee Girl, unbeaten after two Churchill Downs races for trainer Dale Romans, makes her stakes debut in the Golden Rod. Sugar Cone, a daughter of Kentucky Derby winner Street Sense trained by Rusty Arnold, scored her first victory in a Keeneland maiden race in October. The field for the Golden Rod (with jockey and morning line odds): Susies Yankee Girl (Robby Albarado, 10-1), Sugar Cone (Joe Rocco Jr., 12-1), Stageplay (Santana, 5-1), Thump (Sophie Doyle, 50-1), Cold Dish (Calvin Borel, 20-1) Charlotte Marie (Jack Gilligan, 50-1), Dream Dance (Brian Hernandez Jr., 6-1), Carina Mia (Leparoux, 2-1) and Dothraki Queen (Lanerie, 5-2).